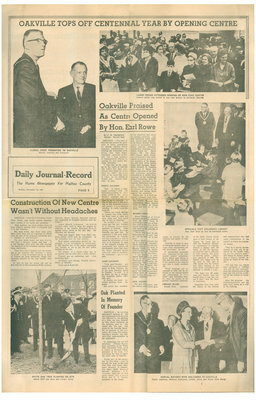 A page from the Daily Journal Record detailing the events of and leading up to the opening of the Oakville Centennial Centre. OAKVILLE – Oakville’s Centennial Centre Navy Street, was finally opened Saturday after months of set backs and problems. Main problem has been strikes which have delayed opening from a scheduled July 1 to last Saturday. But even before that there were problems. First there was an argument in council over the size of the proposed swimming pool – Olympic or semi-Olympic? The pool, which hasn’t yet been built, will have a 25-metre length, half that of a full Olympic sized pool, but still meeting the standards of the Canadian Amateur Swimming Association. Then there was a dispute over the awarding of the contract. The contract – worth $1,178,225 – went to Richard and B.A. Ryan of Toronto but local contractor, Droge Construction objected to the way tenders were called. He said he had the lowest bid and he also objected to the acceptance of late tenders. However, Mayor McLean Anderson rejected any suggestion of irregular practice over the tenders. Laurie Mannell, nicknamed the town’s severest critic, tried to delay the project by objecting to the Ontario Municipal Board against sewer works at the site. But the objection fell through. Final and biggest delay were three separate strikes which held up completion of the swimming pool for four months. Even before construction started on the complex, it was surrounded by controversy. In 1965 election one of the major campaigns was whether or not to put the new police building on the site. The project, as it stands today, has an art gallery and an adult and senior library. Planned are an auditorium and the swimming pool. Architects were Dunlop, Wardell, Matsui, Aitken of Oakville. Oakville – The town of Oakville has earned the gratitude of future generations by placing cultural before economic considerations in building the centennial civic centre, Hon. Earl Rowe, lieutenant-governor of Ontario, told a huge audience of representative citizens in opening the new centre Saturday afternoon. “I trust that as the years go by the youth of Oakville will reflect that their forefathers were ready to take down the dollar sign and think of the years that were to follow, for the benefit of society and human relations,” he said. “This is indeed a very happy occasion,” said the lieutenant-governor to the dense crowd in the new library’s exhibition hall after being introduced by Mayor McLean Anderson. “I am glad to be in Oakville today to take part in the opening of this beautiful Centennial project. It is a beautiful building. It really looks like Oakville. He recalled that many years ago the late Viscount R.B. Bennett, former prime minister of Canada, while driving with him through Oakville had said that he considered it the most beautiful community in Canada, and had expressed his wish to spend his retirement either here or in England. In spite of the changes wrought by commercial and industrial development since that time the town’s beautiful homes were still much in evidence, the lieutenant-governor says. “Your good location and climate and your good people seem to keep Oakville one of the most beautiful towns in Canada,” he said. “It is an honor for me to declare this beautiful edifice officially open. In closing, his honor extended greetings from the queen. The crowd that overflowed the exhibition hall where the opening ceremony was held numbered many hundreds. Among those introduced by Reeve Herbert Merry, master of ceremonies, were Mayor McLean Anderson, Donald Bath, chairman of the library board, Dr. Harry Harley, MP, Jim Snow, MPP, Mayor Sarto Desnoyers of Oakville’s twin municipality of Dorval, Quebec and members of his delegation and their wives, Halton Judge Alan Spragge, magistrates Kenneth M. Langdon and James R. Black, Don Munro, chairman of the Oakville recreation committee, Councilor R.J. (Kelly) New, chairman of the Centennial project committee, Rev. W.R. Anthony, president of the Oakville Ministerial Association, William Roddy of the Ontario Library Services, G.M. Farrow, architect of the building, and George Buckingham, the contractor. Taking part in a brief religious ceremony were Rev. John Pietra, assistant pastor of St. James Roman Catholic Church, Maxwell Yan, representing Rabbi Sheldon Kron of Beth-El Synagouge, and Rev. W.R. Anthony. Mayor Desnoyers of Dorval brought resounding applause from the crowd when, in presenting a province of Quebec crest to the town, he declared that his Province was still loyal to the principle of confederation. Reeve Merry followed this up by saying that interprovincial visits between the people of Oakville and those of Quebec would help further understanding and friendship between the two provinces. The new civic centre, said the mayor, would serve as a centre of activity for the children and adults of Oakville. “Oaville is about to open a Centennial project when so many other communities are still promising,” he said. In introducing councilor New, chairman of the Centennial project committee Reeve Merry paid tribute to him and the other members of the committee for what he said was a really excellent job. “These buildings are an example of what can be achieved by the various boards and commissions of the town,” said councilor New. He read the names of the project committee members. Donald Bath, chairman of the public library board, gave a brief history of the library. He noted that in 1839 the Wesleyan Methodist organization in Oakville started a library with 100 books. In 1887 the Mechanics Institute had a collection of 1,300 volumes . The name of Oakville public library first appeared in 1895. The library was taken over by the town in 1922, and in 1956 moved into the former post office building on the main street. Circulation now amounts to 500,000 a year. “We hope you all enjoy your new library, that you benefit from it, and that you use it often,” said Mr. Bath in conclusion. Councilor New then read the names of the citizens and organizations who had made contributions to the project, to whom he expressed thanks. “This is a lasting demonstration of what can be achieved by the people working for the common good said Sidney H. Bonser, president of Procor, Limited, replying on behalf of the donors. After the program the lieutenant-governor and his suite were taken on a tour of the building. OAKVILLE – Saturday afternoon’s opening of the new Centennial Civic Centre was followed by the planting of a white oak tree, donated by Mrs. Hazel Mathews, on the southern part of the centre site. The tree was given by the Oakville historian in memory of her ancestor, William Chisholm, Oakville’s founder and Halton’s first representative in the legislature. In concluding the brief ceremony William Bateman, secretary of the White Oak Centennial Trust, paid a tribute to Howard Caine, president of the trust, for promoting the idea of planting white oaks in Oakville. Taking part in the ceremony by shoveling earth around the base of the tree were Hon. Earl Rowe, lieutenant governor of Ontario, Jim Snow, MPP, Mayor McLean Anderson, J.C. Cornwall, chairman of the parks board, and James Black and R.E. Goodin, members of the board.